The sword is 2,100 years old. Click for a larger view. A rare Roman cavalry short sword made before the time of Christ that has been preserved in its entirety and still cuts is one of several recent highlights of the Celtic Collection Program in Milner, Georgia. The ancient short sword is from the La Tène III (circa 2nd to the 1st century B.C.) timeline. It was in the H. Liebert private collection, Cologne, Germany, and was acquired during the 1960s and ’70s. The iron sword is completely intact and is 20.5 inches long. Over time it has become permanently attached to its iron scabbard, and the buckle remains from where it once hung from a belt. Its thin hilt, which terminates in a small pommel, would have once been encased in wood. According to a spokesperson, the sword has a double-edged blade still sharp enough to cut. Though the ancient sword is believed to be from Gaul (modern France), Peter Connolly reports comparable swords in his book, Greece and Rome at War. Similar swords reportedly have been recovered from Switzerland, France, the Thames in London, and Embleton, England. The sword belonged to either a male or female warrior specializing in close combat tactics, a spokesperson stated. 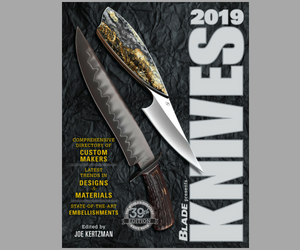 BLADE gathered 14 years of Knives annual books into a single collection. Get it here.